Where is your Bible? Is it digital text on an iphone? Might it be a dusty book that is setting on a shelf somewhere? Or are you one of those with the sun baked bible in the back of your car that has not been moved in years? My bible the one I actually read and try to keep with me fits in my back pocket. It is compact where highlights, notes, and pages worn are a comfort to me as I know where each treasure already discovered can be found. This bible is also my favorite reading version the New International Version (NIV) 1984 translation. Do you have a relationship with your Bible like this? Do you know what translation your bible contains? When I was in high school the Holy Spirit started encouraging me to read the Bible. I had never read it outside of church before. So one night I found a black leather bound bible that had been given to me at some point in the past. I started trying to read it. It was a King James (KJV) translation with all the thees and thous from the King’s English of another world. I struggled to read it and it put me to sleep every time. I then remembered a children’s bible that my Grandmother had given me when I was younger. It was childish looking and had a picture of Jesus on the cover holding a lamb. I wanted to read the Bible so why not give this one a try. This Bible was a more modern translation called the Living Bible (TLB). This translation is paraphrased and intended to be readable. It was in this bible that I was able to read and comprehend amazing things about God and His words to His children and to everyone in Creation. The Bible is an amazing work. The contents are provocative and shocking. Many people assume they know what it contains however if you have never taken the time to read it then your assumptions are most likely wrong. I became excited about God and His word but there was not a chance that I as someone in High School was ever going to take that Children’s bible out of my room to be seen in public. Thankfully a friend gave me a student bible with the NIV translation. The version that I still love to read even today. King James is a literal translation of the original text and it is a translation the way people spoke in 1611. The Children’s Bible was great to casually read but TLB is a paraphrase that does not seek to keep the exact words of the original text. The NIV is a hybrid called “dynamic equivalent”. The goal of the translation is to keep it as accurate as possible to the original language while updating the grammar and word order to be more in line with the English of a modern reader. This version was immediately readable to me and I set upon a course to read it from start to finish like one would with any other book. 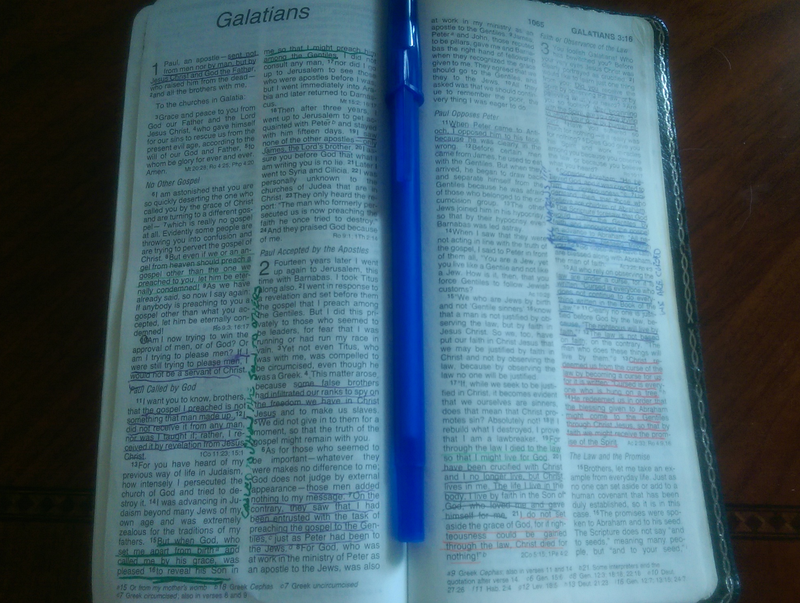 Today I still love the NIV however I do not use it to study, or teach. For accuracy and seeking a literal translation I recommend the ESV or even the NKJV. Listed here is a table that categorizes different popular translations or versions of the Bible so one can compare and contrast. Each version has a different purpose and should be used in the right context. I highly recommend the ESV for those looking to start reading the Bible. Reading the Bible will change a Christian’s life. We as children of God cannot come into His presence and not be changed. God is Holy and he is powerful. Just reading what He has written leaves a mark. Moses when he was on Mount Sinai and interacting with God, like receiving the Ten Commandments, asked if he could see God more directly. God answered the request but He did so in a way that would not destroy Moses who is still a sinful man. That is an amazing event for Moses to be close to God and yet not be consumed by the Holiness of God. We have similar access today through the words of God as he wanted them written in the Bible. Be made alive with God’s word. Come into His presence and hear what He has to say to you His child. If you are not His child hear what He has to say about being adopted and becoming a child of the King and Creator. While the encounter Moses had with God on the Mountain is amazing what is also amazing is the effect it left on Moses when he returns to the people of Israel after leaving the Mountain. Moses was altered and his face reflected God with whom he had been speaking. The same is true when we his children spend time reading and thinking about the words God has left for us. God’s word is a reflection of his nature and his words point us to God’s story for Creation. People will know you have been in the Bible and you will not be able to contain speaking to others about it. Everything we are doing in this life now is preparation for life with God in eternity. John Piper in the video asks the question where else will we go. How else will we know who He is? The Bible, the words of God himself, are life to us. Do we love God enough to read what he had to say and be transformed by it?